Getting into an RPG system can be daunting. That’s made worse when the system allows you loads of cool choices, like GURPS does. For me, the way into any game has always been to build a hero and take the playing from there. Uglok is a pretty stereotypical name, I admit, but it works for my purposes. I envision him as a proud and bold young warrior from a forest-dwelling Neanderthal tribe, ready to take his coming-of-age hunt. Big, strong and skilled would outline my initial ideas. Never being one to ignore science, I grabbed a useful article from online which gave me an overview of the current theory regarding Homo sapiens neanderthalensis. From this I am able to imagine the sometimes nomadic and wild-living Neanderthal culture, which includes speech and music, and extend it with the more fantastic elements of Gooch’s ideas. Some tribes might be farmers, others hunters; all are matriarchal and influenced by female-dominated magic and ritual. GURPS offers choices. For the sake of simplicity, I have given Uglok 150 character points, making him a mid-range standard hero-type. He has exceptional strength, good dexterity, average IQ and good health. I’ve also boosted his Will and Perception to better reflect the concept of a hunter – he needs to be able to spot the prey and withstand the painful wrestling match that lies at the heart of Neanderthal hunting. I’ve decided not to invest in more than average physical appearance for Uglok, mostly because it costs points to be handsome which he might prefer me to invest in his survival skills. Technologically, Uglok is Stone Age (TL0) and illiterate, the latter netting him 3 points back to spend elsewhere. As wealth isn’t a consideration, I’m leaving Uglok with average ratings, reflecting his supported role within the tribe. He gets a simple $250 starting wealth (no, not dollars – just the generic GURPS value system using that symbol) which will hopefully buy him a sturdy spear later on. I’m not going to give him any special status either, as fits the concept of a up-and-coming young hunter ready to prove his worth. Although GURPS presents the next step as choosing Advantages and Disadvantages, I want to give Uglok the core skills of a hunter first. This will allow me to spend precious character points on the things he needs most: field skills. I’ve decided to first pick out all the skills I feel Uglok needs and then, once I have an idea of how many there are, I’ll assign some extra character points to some of them (thus making them better). 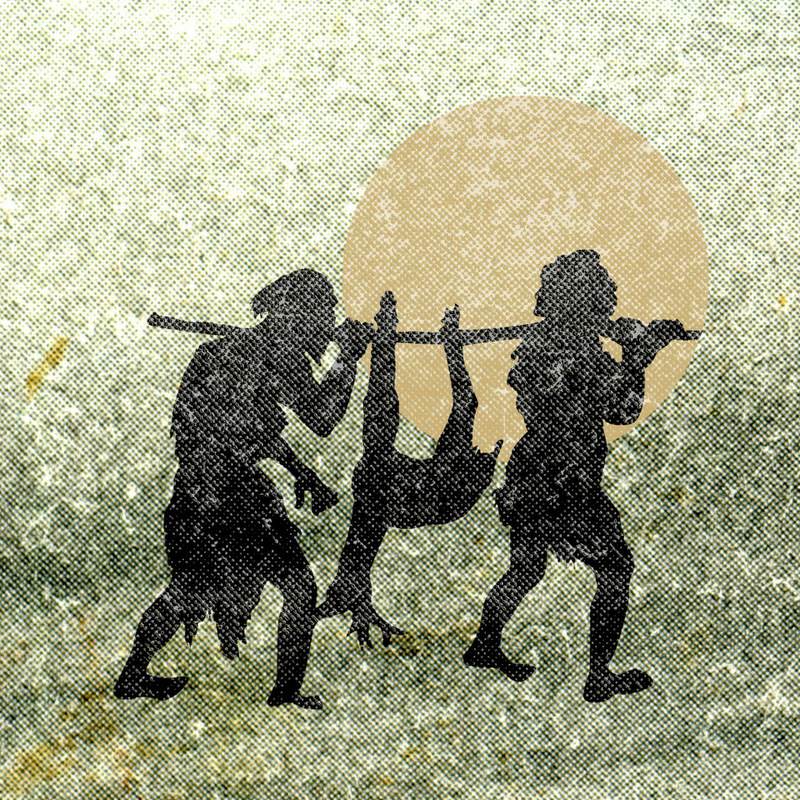 My first choices are the skills for hunting, beginning with weapons: axe, knife, spear, brawling and (controversially) thrown spear. Hunters need to be able to find and stalk their prey so I opt for giving Uglok some field skills: survival (woodland), tracking and navigation (land) come first; also added are stealth, climbing, swimming and fishing. I also give him skill with traps and cooking, not to mention local area knowledge. Finally, to give him some social skills, I opt for intimidation and carousing skill. Having worked out the 17 skills I feel Uglok should have, I then distribute some additional character points to boost his abilities. Skill levels modify the core attribute they lean on when tested, so I tend to favour either those skills that need a boost due to his average IQ or which benefit from his high Dexterity and Strength. In GURPS, an Advantage is “a useful trait which gives you a mental, physical, or ‘social’ edge over someone else who otherwise has the same abilities as you”. Each Advantage has a character point cost, and these are counter-balanced by optionally taking Disadvantages (which give you extra character points). I’m keen to keep the Advantage costs low, as I have already managed to spend 149 character points from Uglok’s starting 150 point pool. Taking the advice from the GURPS book, I decide to give him Absolute Direction, meaning that he’ll always know which way is north and allow him to retrace any path taken within a month. I also give Uglok Acute Hearing, allowing him slightly better than usual auditory ability. I invest in him being Fit and having Temperature Tolerance down to 5 degrees Fahrenheit, reflecting the effect living in the wild has on human physiology and the Neanderthal comfort with colder climes. I also give him a fair ability with Night Vision. This latter advantage is in deference to Gooch’s suggestion that Neanderthals were nocturnal moon-worshippers, thus adept in the dark. The most appropriate disadvantage, needed to earn back the 19 points overspent, seems to be Duty (Tribe). This duty is active almost all of the time, netting Uglok 15 points. The idea is to represent the mutual dependency upon which the tribe is built. I augment this with a strong Sense of Duty (Hunting Party) to boost the idea that Uglok is part of a tribal hunting party. The 5 points from that leave me one extra point to invest in Skills, so I top off his Traps skill. Finally I just need to equip Uglok. I want to keep this simple and within the starting $250 nominal budget – although that might seem strange, it really just helps keep equipment levels fair. Uglok chooses an axe, a spear and a small knife for starters. Neanderthals don’t seem to have worn clothing, so he ignores that. I give him a sleeping fur for the hard winter nights and, running out of appropriate choices, a second knife and a second spear. Thinking about it, I am struck by how amazingly limited the equipment choices are likely to be in the Stone Age. The last task is to write up the character sheet ready for play. 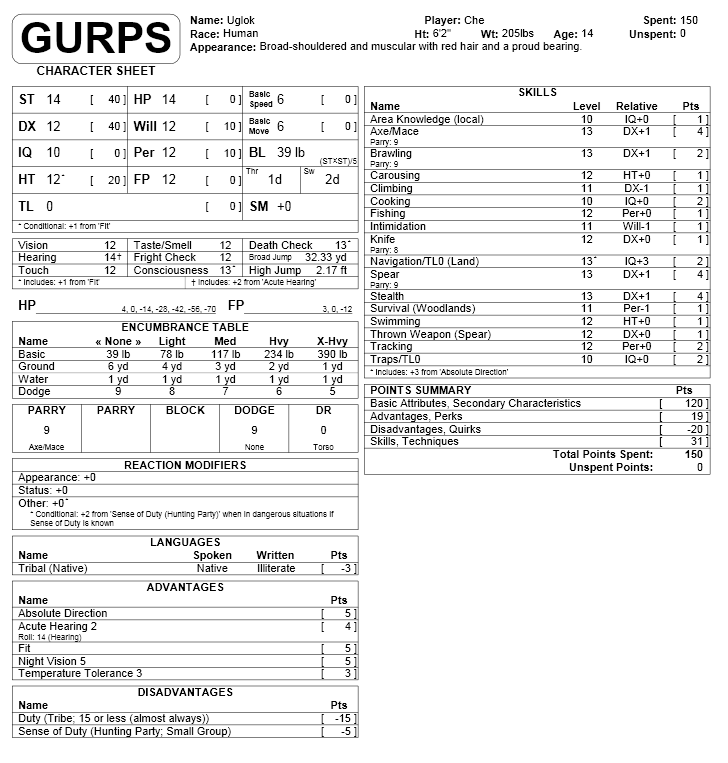 I cheated and used the GURPS Character Assistant software, which makes life very much easier. The attached picture will let you see the finished character. Yesterday afternoon I ran Uglok through an encounter with a large Wild Boar, using the GURPS system. The encounter was surprisingly tense, with Uglok being charged by the boar, spearing it four times before it finally went unconscious (boars are very stubborn beasts), and then using his hand axe to finish the job. The only problem was that, due to the cutting tusks, Uglok will be laid up for a month recovering from his injuries. This explains why Neanderthals hunted in groups. An excellent run through combat which refreshed my memory with GURPS and reminded me just how cool the system is. Bacon for all in Uglok’s tribe!